Have you ever bought a toy at a store? Have you had a haircut or ordered food in a restaurant? Then you've used goods and services! Goods and services are everywhere. They're in stores, homes, schools, restaurants, farms, and factories. So, what is a good? And what's a service? Read this book to find out. 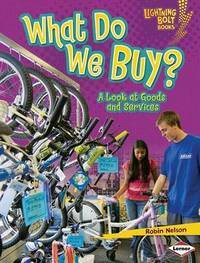 Robin Nelson's jobs have always kept her surrounded by books--as an elementary teacher, working at a publishing company, and working in a library. But her favorite job is writing books for kids. She has written more than 140 nonfiction books for children. She lives with her family in Minneapolis.